They recently celebrated two years of marriage, despite his ongoing legal battles against a number of individuals who are accusing the singer of giving them herpes. 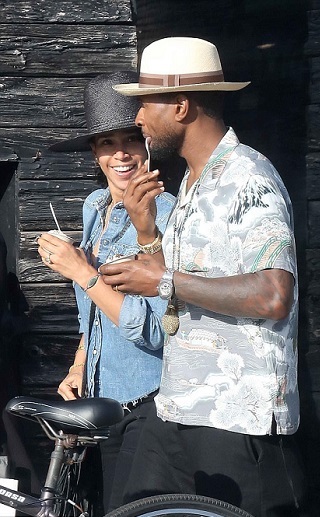 And Usher put on a brave face in the wake of the explosive accusations as he took his wife Grace Miguel out for an ice cream date in Los Angeles on Sunday afternoon. The singer, 38, walked side-by-side with his second wife, 48, amid allegations that the singer gave a sexually transmitted disease to multiple people. Dressed comfortably, the U Remind Me musician wore black shorts and a short-sleeved grey and white printed button-down shirt which featured colorful bridges and mountains. 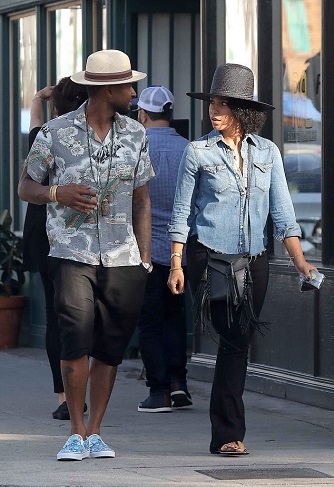 He added a pair of baby blue slip on shoes to his eclectic outfit and sported a beige fedora with a red and tan band. Grace opted to cover up in a long-sleeved button-down denim shirt with the sleeves cuffed up to her elbows. Grace - the Executive Vice President of Marketing/Creative Services at Island Def Jam Records - shielded her eyes from the afternoon sun in a large brimmed black hat. The music manager wore a pair of flowing black linen pants and flip flops for her casual stroll through the city with her husband. Grace and Usher were married in a small ceremony on the island of Cuba during Labor Day weekend in September 2015 after dating since 2009.